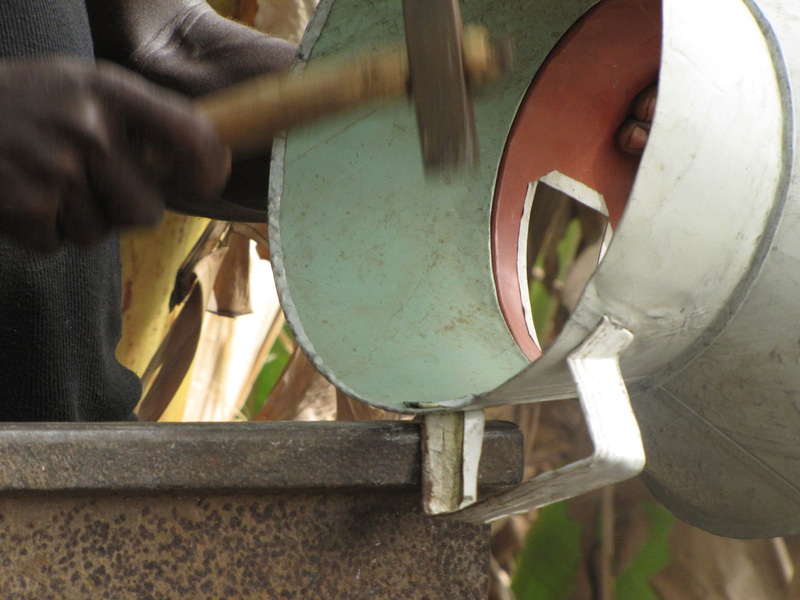 Gyapa Enterprises works with over 450 metal artisans to manufacture the external metal casing of the cookstove. The external metal stove body is cut and hammered together by hand using scrap metal. Typical scrap metal is sourced from discarded roofing sheets, car doors, refrigerators, air conditioner units and waste pieces from local aluminum companies. Metal artisan manufacturers secure the ceramic liner into the finished stove body and paint the finished stove. The manufacturers sell their finished product to distributors, local retailers or directly to customers. Meet some of our metal artisan entrepreneurs. Peter received training to become a metal artisan manufacturer in 2003 and is now one of the largest metal artisan manufacturers in Ghana. He manages a team of 10 employees and produces over 1,200 stoves per month. Peter has grown his business slowly each year and reinvested his profits in its expansion. Stoves produced out of this site continue to be of the best quality and are sought after by retailers and consumers. 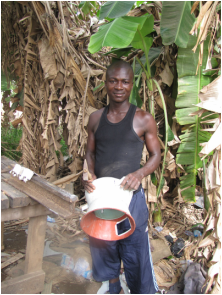 Peter and his team manufactured nearly 10% of all Gyapa cookstoves in Ghana in 2012. Peter has benefited from working capital loans which he has used to expand his production capacity. 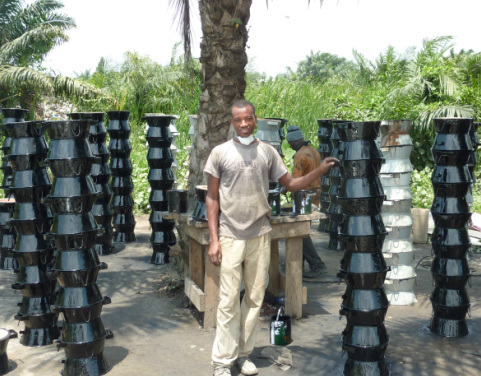 Through the support of carbon credits, Relief International is able to provide strategic, sustainable investments throughout the value chain, working to support individual business and to expand market linkages and networks to increase access of Gyapa stoves to new communities and households. Gyapa cookstoves metal bodies are made from scrap metal and cut, hammered and adhered, all by hand. Labaran Issaka, leader of the Ashaiman manufacturing group, explains in this video (right) how his team of metal artisans create a Gyapa cookstove body, and how many cookstoves he sends to the market post-production. The Ashiaman Manufacturering Group is a key manufacturer in the design and production of Gyapa Enterprises’ cookstoves. The group is led by Labaran Issaka, a very technically and business-minded manufacturer, who maintains organized records of the group’s productivity. Mr. Issaka has also been involved with preliminary efforts for stove re-design and testing market reaction to improved stove variations. The Ashiaman Manufacturer Group is the largest manufacturing group in Accra, located in a major industrial suburb of Ghana’s capitol, and has already partnered with Gyapa Enterprises in the manufacturing of its stove. 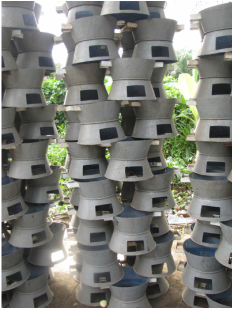 This manufacturing group averages production of over 3,000+ Gyapa cookstoves per month and employs 25 metal artisan manufacturers. In addition, the group also serves as a hub for ordering and purchasing stoves to increase market opportunities and additional sales.